“In the chaos of the conflict… Hamas…granted its security forces free rein to carry out horrific abuse, amounting to war crimes." Harari is most famous for leading Golda Meir's Mossad task force to kill all the Munich terrorists. 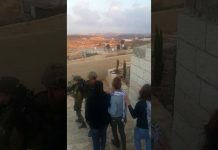 Government lawyers admitted to the court that there was massive illegal building on the outpost, claimed by leftists as a source of violence. Vandalizing a archeological site is a serious criminal offense. For Israel, Russia’s buildup in neighboring Syria is a major concern. The Hudson Institute honored PM Netanyahu for his achievements and leadership of the State of Israel. Prime Minister Binyamin Netanyahu vowed Tuesday night that God will "avenge the blood" of three teens murdered by Arab terrorists on June 12. JERUSALEM – Prime Minister Netanyahu found himself trying to extinguish a political and religious brushfire in his own government this week after Jerusalem Mayor Nir Barkat on Sunday closed the Mughrabi Gate bridge, which leads to the Temple Mount. Sinwar has been the topic of many conversations in Israel's security apparatus, over the growing need to assassinate him. The architecture of the Herodian bath is very similar to the baths and cisterns discovered in nearby Qumran (across the Dead Sea). Frequent travelers to the US from Israel – and vice versa - will soon have a smoother time making the landing, thanks to Israel’s entry into the US Global Entry Program. Alert IDF soldiers spotted a group of Gazans heading for the security fence across from El Bureij. Here's what happened next. President Reuven Rivlin is mourning the passing of his 84-year-old older sister Etti Herling Binyamin. Ramadan Abdullah led a delegation of Palestinian Islamic Jihad terrorists to Iran to ask for money, and suggestions on how to "bolster the intifada." Praising his soldiers for not using violence while criticizing them for not using violence certainly adds this battalion commander to a long list of IDF victims of crazymaking rules of engagement. Legal aid society Honenu reported that police let the young man go shortly after his detention without an interrogation. The Givat Oz V'Gaon was among the sites overwhelmed with Sukkot holiday tourists from around the country. Shaked added that Abbas is a terrorist and not a proper partner for discussion. 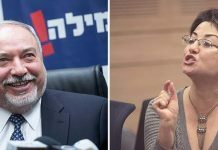 Minister Liberman did not retract the comment mentioned in the complaint. El-Sisi has embarked on an ambitious plan to destroy Hamas’s tunnel infrastructure underneath the Egyptian-Gaza border. The PA does not need an official policy of incitement, The Arab culture does a good job at it all by itself. PA Arabs now can watch their favorite soccer teams, named after some of the most barbaric terrorists.